Well today was another Christmassy afternoon, I decided to make something a bit different so created a hanging shadow box, using the Hang your Stockings Framlits, and some of the gorgeous double stitched ribbon. 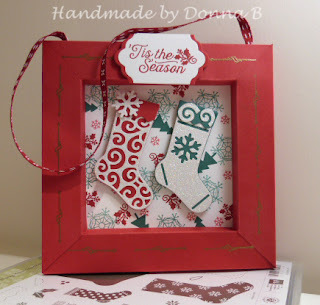 The frame was created using a 12 x 12 piece of Real Red card stock, I decided to stamp the background and also add the ribbon before putting it all together, there are so many wonderful tutorials on you tube. 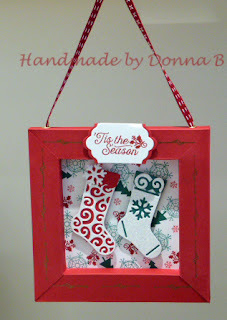 I used 3 stamp sets - Colorful Seasons, Hang your Stocking and also Oh, what Fun for the back ground the sentiment is from Oh What Fun and I used the Lots of Labels framelits. 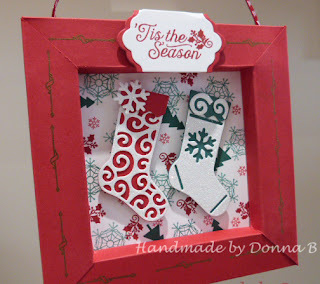 The stockings were cut from Real Red and Tranquil Tide and I used Glimmer paper for the overlays, I put the swirl cut out and the snowflake to embellish the top of the stockings. I also heat embossed the the swirl line with gold.